Landmark regional investments such as the transit expansion underway in the greater Minneapolis-Saint Paul metropolitan area have the potential to significantly change long-term land-use patterns and travel behavior. They also raise important questions for policymakers and elected officials regarding the potential return on investment. 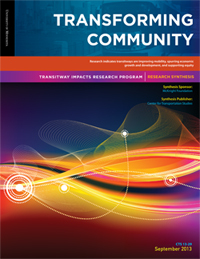 A new synthesis report from the Transitway Impacts Research Program (TIRP) pulls together seven years of research conducted by University of Minnesota researchers to help answer these questions. The report summarizes the actual and projected impacts of transitways on the Twin Cities region, offering lessons learned to help guide the build-out of the rest of the network most effectively. It concludes with a set of implications for policymakers. The Twin Cities metro region is in the midst of a transit build-out. The Metro Blue Line (formerly known as Hiawatha), Red Line (Cedar Avenue Bus Rapid Transit), and Northstar Commuter Rail are in operation, and the Green Line (Central Corridor) opens next year. All are part of an expanding regional transit network. Under the TIRP program, which was launched in 2006, University of Minnesota researchers provide an objective analysis of data, public perceptions, and complex impacts resulting from transitway investments. Their research is unique in its breadth, scope, and ability to provide real-time analysis of the changes experienced when a region introduces high-quality transit service.